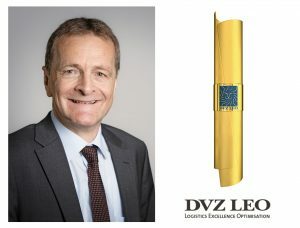 At this year’s LEO-Gala in Hamburg Hans-Jörg Bertschi was presented with the Award in the category ‘Lifetime Logistics Achievement’. The prize honours his role in Switzerland’s rail based transit transport policy, the development of a European intermodal transport network as well as his accomplishments in successfully growing the Bertschi Group into a global chemical logistics player over the last 30 years. Already in 1985 Hans-Jörg Bertschi tackled Swiss transport transit policy in his doctoral thesis, demonstrating the feasibility and macroeconomic benefits of a flat rail link through the Alps from Germany to Italy. The following political discussion added new impetus to this ambitious project,resulting 31 years later in the opening of the Gotthard Base Tunnel (GBT). Bertschi Group has been an advocate of intermodal transport since over 50 years,successfully shifting long distance transports from road to rail across Europe. In his role as Chairman of the Board of Directors of Hupac,Hans-Jörg Bertschi is actively developing a rail-based Intermodal Network all around Europe and by that makes a big contribution to safe, sustainable and environmentally friendly freight transport. The award also acknowledges his achievements as entrepreneur. It is impressive to see, how Hans-Jörg Bertschi formed the logistics company from Dürrenäsch during his 30 years, 24 thereof as CEO. The medium-sized transport company developed into a globally acting service provider for the chemical industry with 2,800 employees, more than 1,000 trucks and 32,000 containers. By the way, when Bertschi entered the family business, the number of employees and containers reached both around 200. With a strategic vision of sustainable and safe transport,he developed the company to today’s size.